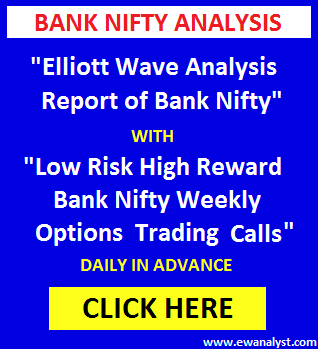 Bank Nifty opened lower at 27395, declined sharply just after opening by more than 250 points to register day’s low 27142 and finally closed 279 points down at 27201. Yesterday, 27534 was immediate resistance on upside and Bank Nifty was expected to bounce towards 27900-28388 in coming days if break and stay above 27534 continuously 15 minutes. But any further delay or consolidation below 27534 could result in further fall towards 27136 and below. Trading strategy was to buy Bank Nifty 27700 Call of 12 Sep expiry if Bank Nifty breaks and stay above 27534 continuously 15 minutes with stoploss of 27399 expecting bounce towards 27900-28388 in coming days and 28500 call of 27 Sep Expiry was suggested to hold without stoploss. 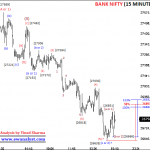 Bank Nifty opened at 27395 and traded below 27534 for whole day, so our fresh trade was not activated. Now, we need to analyze fresh charts to calculate further move. 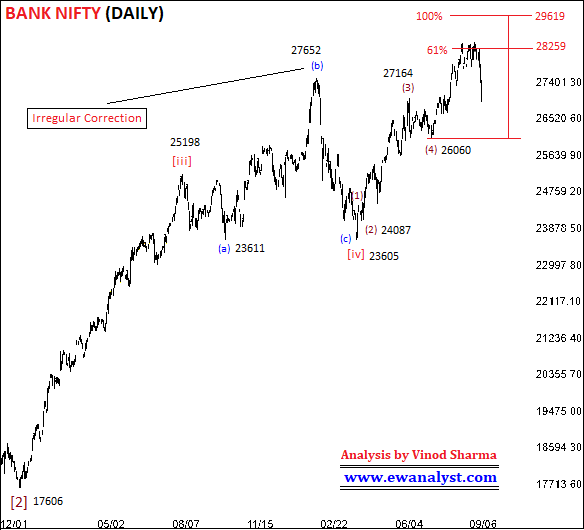 This is Daily time bar chart of Bank Nifty which I am expecting as start of wave  (explained in my all time frame report. There is no change in wave counts on this chart. This is the same chart with explanation which I had explained in last report because there is no change in wave counts on this chart. It seems wave [i],[ii],[iii], may be completed till 25198, wave [iv] may be completed at 23605 as irregular correction and wave [v] may be in progress. 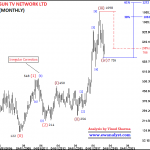 Within wave [v], it seems wave completed at 24651 may be wave (1), wave completed at 24087 may be wave (2), wave completed at 27164 may be wave (3), wave completed at 26060 may be wave (4) and wave (5) may be completed at 28388 or still in progress. Wave (5) achieved 61% projection after breaking above 28259 and next 100% projection is placed at 29619 which may or may not be achieve. 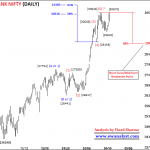 Bank Nifty achieved 28388 till now. Now, we need to analyze wave (5) of [v] started from 26060 on separate lowest time frame chart to calculate its inner waves. 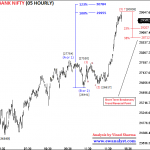 This is 05 Hourly time bar chart of Bank Nifty covering move from low 26060. 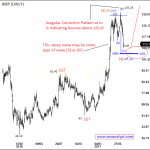 This bounce I marked as start of wave (5) as marked on Daily chart. Wave completed from 26060-27164 may be wave (A), wave completed from 27164-26671 may be (B) and wave completed from 26671-28378 may be wave (C). But the further decline after 28378 looks like an Irregular Correction. So, there is possibility that wave (5) progressing as Ending Diagonal Triangle (ED) with inner wave (i) of ED completed from 26060-28378, and wave (ii) of ED may be in progress as Irregular Correction from 28378. 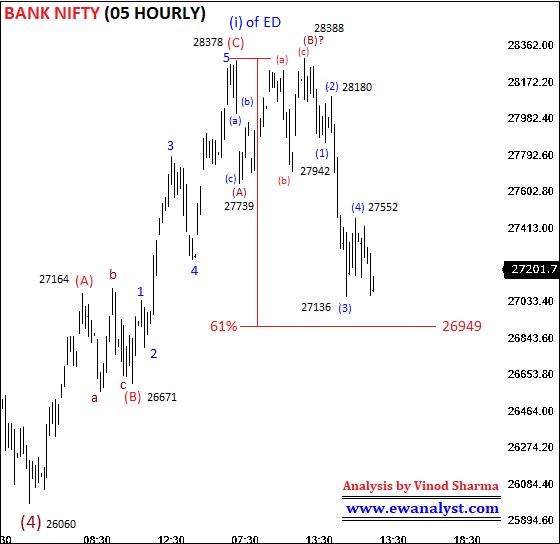 61% retracement of wave (ii) of ED is placed at 26949 because wave (ii) of ED often retraces 61% or more. So, we need to analyze decline started from 28378 on separate lowest time frame chart to check if pattern of decline from 28378 is following the rules of Irregular Correction. 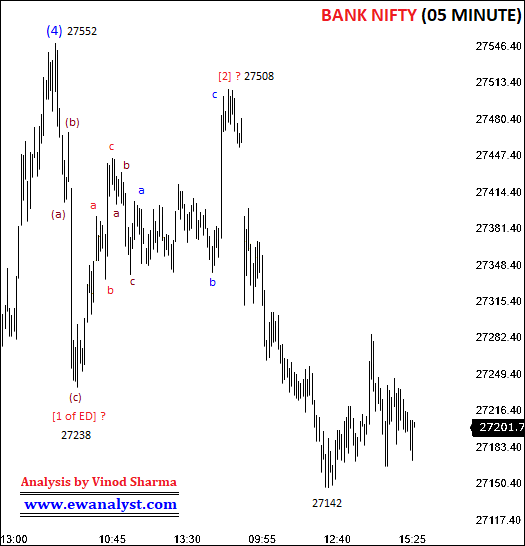 This is the 30 Minute time bar chart of Bank Nifty covering move from 28378 which I am expecting wave (ii) of ED [2nd (ABC)] of wave (5). From high 28378, the first decline from 28378-27739 looks like an (abc) wave and further bounce from 27739-28388 also a (abc) move, so the combination is indicating a possibility of Irregular Correction with wave (A) from 28378-27739, Irregular (B) completed from 27739-28388 and wave (C) may be in progress. 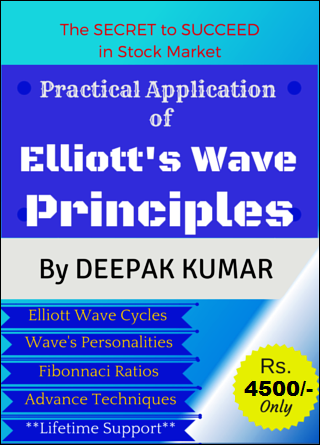 Within wave (C), it seems wave completed from 28388-27942 may be wave (1), wave completed from 27942-28180 may be wave (2), wave (3) may be completed at 27136, wave (4) may be completed from 27136-27552 and wave (5) of (C) may be in progress. 38%-61% projection for wave (5) is placed at 27073-26778, so wave (C) can complete somewhere around 27073-26778 range. 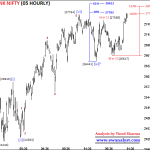 38% retracement of progress of wave (3) is placed at 27534 which is breakeven point and resistance on upside and Bank Nifty if break and stay above 27534 for more than 15 minutes can result of further bounce towards 27900-28388. Now, let’s analyze the progress of wave (5) started from 27552 on separate lowest time frame chart to check its pattern. 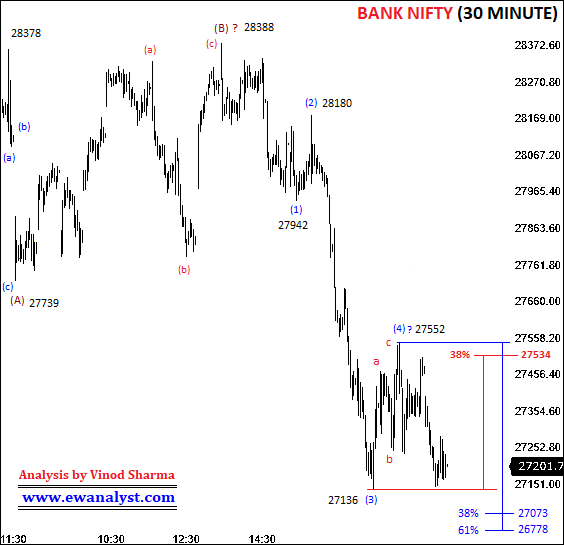 This is 05 Min time bar chart of Bank Nifty covering move from 27752. I am not able to identify any confident pattern on this chart. The combination of inner waves is not following rules of any pattern. So, can’t conclude anything from this chart. 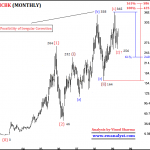 For Short Term, the formation of Irregular Correction type of pattern at top is indicating one more bounce for new high above 28388 in coming day but there is no idea of exact bottom. 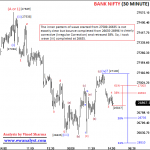 27073-26778 is the normal support range on downside whereas 26949 is 61% retracement of wave (ii) of ED. So, there is possibility of a small or big reversal from 26949-26778 range. On upside, 27534 is the immediate breakeven point on upside and Bank Nifty if break and stay above 27534 for more than 15 minutes can result of further bounce towards 27900-28388 in coming days. 1. So, Bank Nifty if trades above 27534 continuously for 15 minutes then 27800 call of 19th Sep Expiry can be bought near 27534 using stoploss of 27399 expecting minimum bounce towards 27900-28388 in coming days. 2. Bank Nifty if get in 26949-26778 range then 27500 call of 19th Sep Expiry can be bought without stoploss. Means stoploss for this call is 0, so adjust the quantity in such a way that you will be comfortable even if call become zero. Otherwise, stoploss will be updated later. Bank Nifty 28500 Call of 27th Sep Expiry bought in 27819-27725 range is in loss of 70%-80% but it can still be hold till expiry without any stoploss because the possibility of bounce for new high is still there but those who are not comfortable can exit the same. These are low risk trading strategies I can suggest in these conditions, otherwise traders can plan their own trade based on the levels explained above.
. I will not be responsible for any trade, loss or profit.